Fun & Natural Bath Products for Little Soap-Dodgers! 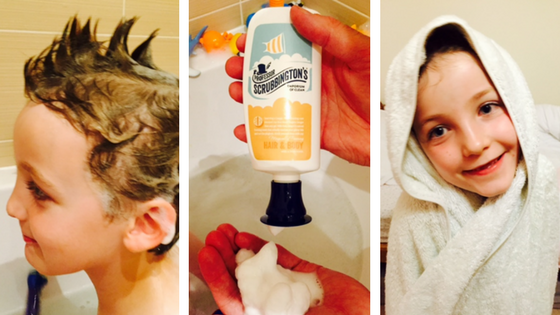 “And so this week at LittleBird, two of our little ones (notorious soap-dodgers) entered the world of Professor Scrubbington’s Emporium of Clean and tested out their new and 98% natural shampoo, conditioner, hair and body wash and deodorant. Available for only £10 for a bundle of 4 via Little Bird with free delivery too, they seemed such good value but did they live up to their bubbly hype? …The short answer is YES!!!! These new and fresh products injected so much fun into bath-time, with our little ones pretending to be Professor Scrubbington and his minion, creating bubbly empires and washing everything in sight, yes, EVEN themselves AND without prompting?! Unheard of! The products smell just divine, such a fresh and refreshing scent and the children even squeaked after washing – they were THAT clean! True to their word, the shampoo and body wash were bubblicious, creating a fantastically foamy froth that cued much laughter in the creation of bath-beards, new hilarious hairstyles and eliciting a new game of froth Frisbee (!?). The hair and body wash was also fantastic to use after swimming, it removed the horrid chlorine smell and was compact enough for the swim bag with no annoying leaks! With the dispenser being so easy to use for little hands, there was little wastage and the children could use it themselves without adult intervention. As a Mum, I am always keen on finding new skincare products that are kind to the children’s skin and I am constantly on the look for new, but reasonable, products with few or no nasties so Professor Scrubbington’s ranges ticked all the boxes. Get yours on LittleBird here!